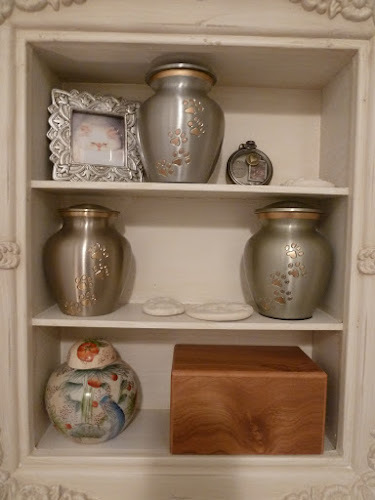 With the loss of Charlotte a few weeks ago, it made five little urns and mementos on my bedroom dresser. I felt like I wanted to have them altogether where I could see them and it felt more respectful. 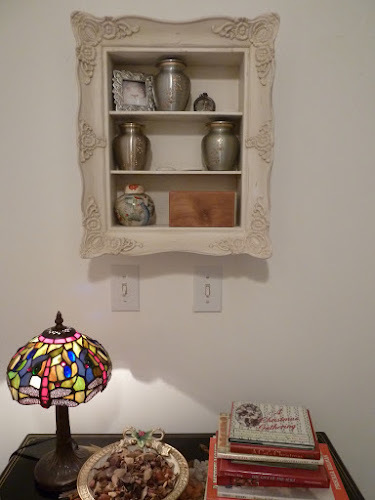 I thought of lots of options but decided to find a little shelf for the hallway. Where it wouldn't be in front of me all day, but I would see it many times. This is the result. It isn't quite done as I have yet to print out a few of the photos, but the frames are ready. It will be done within a couple days. This is a sweet idea Erin and beautifully done. Please show a photo when the photos/names are attached.